If you were to put together a list of production power tools, a biscuit jointer would most probably feature somewhere at the top. Such is their versatility and ease of use that rapid carcass construction, amongst other things, is in everybody's reach with a few hundred quid to spend. 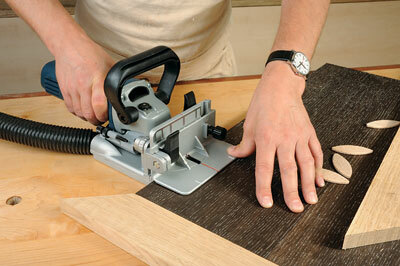 For a minute, forget Dominoes, dowels and pocket hole systems, for these lend themselves to some specific tasks, the biscuit jointer is for many makers the default method for construction. For a machine to be worthy of a place under the bench it doesn't have to have all the whistles and bells, and believe it or not, it doesn't have to operate to within tolerances of less than 0.5mm. All these joints should be regarded as 'first-fix' compared to those produced on a spindle moulder, tenoner or router table where fine adjustments can be set and the operator's physical input is minimal. What hand held machines should be capable of is reliable, repetitive settings over and over again and that's what we found with the GF 22A. These are tools of convenience. I know it's wrong to assume knowledge but there aren't any features on this machine that F&C readers need explaining: adjustable height and angle fence, depth of cut presets, anti-slip device, spindle lock, extraction port - they're all there and they're easy to operate. What's more, they work. The level of finish on our unit was excellent which leaves me rather short of words other than it is better suited to right-handed use than left with the switch being side mounted. The body is slim enough to feel in control and the 670W motor is not a brute. To give you an idea of the balance, it will rest quite comfortably on the edge of a 45° mitre registering perfectly in position to make the cut. 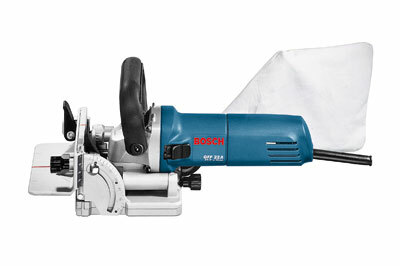 An 800W motor is not unheard of for industrial jointers and they would undoubtedly perform better on solid material over time, but a sharp blade and a good rate of extraction will serve you well on a smaller machine like this. 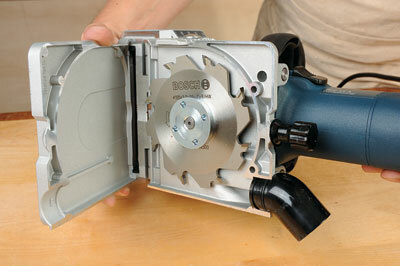 There's easy access to the blade chamber to clear any blockage without dismantling the machine and losing settings. Entry level it is not, because the build quality and finish is much better than that. 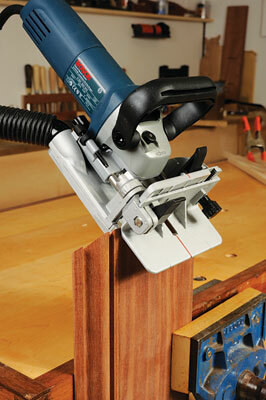 For a basic machine for everyday use you cannot go wrong.